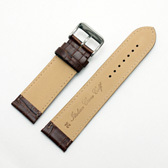 This dark brown flat padded watch strap has a matt crocodile grain and is available in wide sizes. 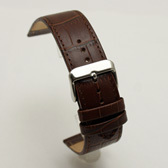 It is made from calf leather with the same colour detail stitching, has 'anti-allergic' lining and a nickel free buckle. Donald Clarke is a company with a long history with replacement watch straps, with earlier generations responsible for the original strap patents for wrist worn watches. 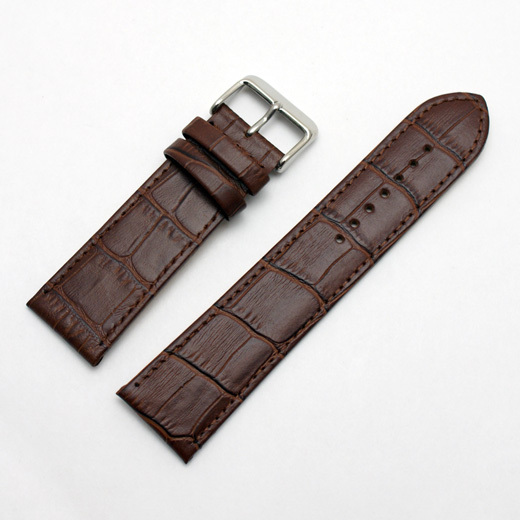 This UK company offers good quality leather watch straps at great prices, making their products really good value for money. This strap will fit any watch where the distance between the lugs is 20mm, 22mm, 24mm, 26mm, 28mm or 30mm (depending on the strap you buy). Like all of our products, it is brand new and in stock in the UK, ready for our super fast shipping.